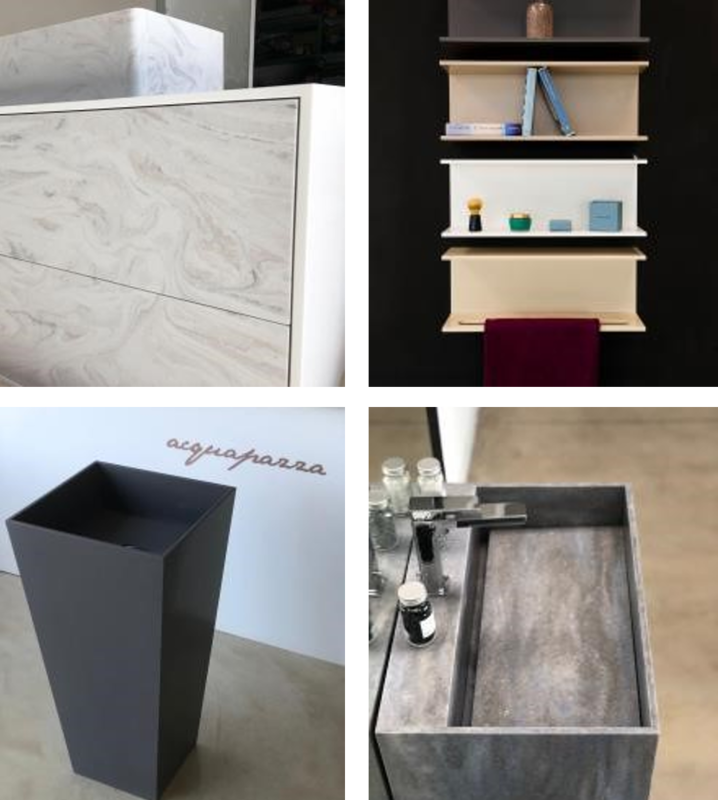 January 2019 – Acquapazza is an outsider brand of Italian bathroom furniture. It originated in Naples as an initiative by Bruna Buglione – an eclectic entrepreneur with a passion for design. The name of the company evokes the colors and flavors typical of the Neapolitan culinary art, while its products convey all the value of Italian artisan workmanship combined with the quality of perfect technical performance. Every Acquapazza product is designed to promote wellness, contributing to the enjoyment of everyday life in the name of design, comfort and functionality. Acquapazza was established to provide complete systems in Corian® Solid Surface, at first with a structured range of elements (washbasins - freestanding solutions - shower systems - bathtubs - accessories), and then proposing a series of furniture made entirely in Corian® Solid Surface. So the three Acquapazza collections were designed: [forty5 - cover - skin] + elements, in which all items are conceived, designed and manufactured entirely in Italy using carefully selected materials and accessories. Due to its aesthetic and functional qualities, Corian® Solid Surface represents the essential requirement for Acquapazza, responding ideally to the needs of the brand in terms of reliability, design versatility and availability of colors. 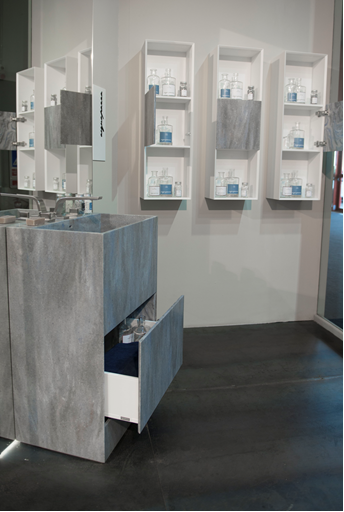 The Acquapazza range includes bathroom items and accessories made in Corian® Solid Surface. Products are carefully designed and tested in the production workshop – DuPont’s ten-year partner. The fabrication process consists in two very different yet complementary coexisting phases: cutting with numerical control machines that guarantee size accuracy down to the millimeter for each element, and then the final finish achieved by skilled artisans, allowing for a true quality control of every finished product. In order to increase the creative possibilities and adapt to any environment, all Acquapazza furnishings are available in a wide range of colors of Corian® Solid Surface, from the classic pure Glacier White to the new shades with veins and particles. This allows for the creation of stylish customized environments, in which the qualities of the material are emphasized and no aesthetic details need be left out. The non-porous nature of Corian® Solid Surface prevents the proliferation of mold and bacteria, its surface is easy to clean and highly resistant to everyday use and it maintains its original beauty over many years. Acquapazza is produced by bsolid Srl, an Industrial Partner that belongs to the Corian® Quality Network with a long experience in the processing of Corian® Solid Surface. bsolid combines the ability to reproduce any design solution required with the achievement of the highest standards of finish and functionality. Some of the company's most important accomplishments include the highly-colored furnishings of the 'University' subway station in Naples signed by architect Karim Rashid, and the super-technological washrooms produced for Trenitalia etr1000 based on a project by Bombardier. Acquapazza (www.acquapazzadesign.it) – Acquapazza is an Italian brand of bathroom furniture. Its products combine stylish design and functionality. The company was created by Bruna Buglione, whose charismatic personality represents the added value and driving energy behind its success. Her passion for design and the extreme attention given to her client’s requirements are mirrored in the Acquapazza team of top professionals who work with careful precision in a pleasant informal atmosphere. Acquapazza’s mission is to create top quality serial productions in which all elements are highly performing and elegantly refined. The manufacture of every product alternates between precise mechanical processes and craftsmanship, and is always customized. All Acquapazza furniture is produced by bsolid srl, an established ‘Industrial partner’ of the Corian® Quality Network’. All photo : Acquapazza Srl (www.acquapazzadesign.it); all rights reserved on design and images.